Peacocks are almost impossible to silence. Know this before you go and purchase one as a pet. Communicate with neighbors about the annoying peacock, whether it is your peacock or their peacock. Talk about compromises to make both parties and the bird happy. Peacocks are beautiful birds originally from India that have been domesticated for over 2,000 years. They are becoming increasingly popular in North America, but the problem is that they can become noisy. These magnificent creatures remain quiet unless they are threatened or it is their breeding season. Peacocks are not known for mingling well with other animals. This situation can easily be controlled. 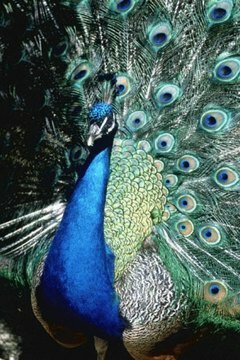 During their breeding season which lasts from the spring months until August, however, peacocks can become very noisy. Keep your peacocks on the most isolated part of your property, away from your house and your neighbor's houses. Have a shelter for your peacock to lock them up at night, when you will be gone for long periods of time, or in extremely cold weather. Make sure the shelter is big enough for them to freely stand and move around. Keep a radio near the peacock shelter and leave it on. This way predators will be deterred from going near the shelter and disturbing the peacocks. This will keep them quiet and undisturbed from any threats. Insulate the shelter the best you can to keep any noise of the peacocks in the shelter area. Noise during the daytime should not be a big deal, but at nighttime both you and your neighbors want to sleep. For eight months you will probably only hear the peacocks occasionally, but during the breeding season you will hear them every night. Set up a windbreak with a treeline between you and your neighbors to reduce the sound of the peacock's cries. The best way to effectively do this is to talk to a landscaper or your local department of agriculture. Ask your veterinarian if they know of any safe surgical procedures to silence your peacock. Most owners do not like this option but if you are serious about silencing your peacock it is a risky but sure way to silence your bird. Remove limbs where a peacock may be roosting on or near your property if the peacock is not yours. The reason the peacock is making noise is because it is mating season, so if you do not allow the peacock to roost on your property the bird will leave. Another trick to getting the bird to leave is removing water sources. Spray the unwanted animal with water any time it begins to cry to deter it from your property and from crying. Trap the unwanted peacock by using a trap, or ask the local Department of Natural Resources to come in and trap it. Fed peacocks will be harder to trap.